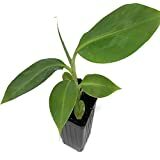 Banana tree for sale – if you plan to plant a banana plant in your garden, it is important to know that it needs plenty of water and fertilizers to grow well. 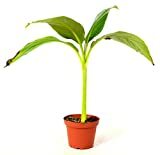 Banana tree for sale it’s not tree it’s herbaceous, plant can be in varieties grown for its edible fruits or for ornamental purposes only. You should also decide what kind of fruit you would like to harvest: dessert fruit or cooking bananas. Climate – banana trees requires full sun with no more than 30% of shade in order to thrive well. A minimum of six hours of sun exposure a day is preferred. It should also be protected from the wind and cold weather. 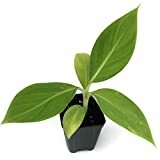 Choose the warmest part of your garden for this plant. Soil – light soil with good drainage is the perfect thriving place for banana trees, although it may grow in any type of soil as long as it drains well. You may use a potting mix because it will dry out fast and that is when the roots will grow. Dig a hole that is 3 feet wide and 4 feet deep. You can also mix your soil with organic matter such as peat moss, compost, manure, kitchen scraps or pine bark mulch to enrich it. Water – bananas require large amount s of water and are very sensitive to drought. Drought may result to longer time to flowering and fruit yielding, reduced fruits size and crop yield. About 4 to 6 inches of water is needed per month for its normal growth. But be careful not to over-irrigate as banana trees are susceptible to damage by flooding, prolonged wet soils and inadequate drainage. Occasional deep watering to leach the soil is also advised. 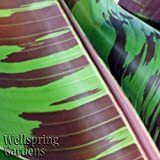 Mulching – mulching your banana tree will help retain the moisture, reduce weed problems near the tree trunk and improves the soil near the surface. Mulch with about 2 to 6 inch layer of bark, wood chips, or chopped off bark. Pruning – Allow only one primary stem of each rhizome to fruit. All excess shoots should be removed as soon as they are noticed to help channel all of the plant’s energy into fruit production. When the fruit is harvested, cut the fruiting stalk back to 30 inches above the ground. Remove the stub several weeks later. The stalk can be cut into small pieces and used as mulch. 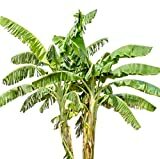 You can prune your banana tree all year round. Harvesting – when the bananas are plump but green you can start harvesting your crops. For tree-ripened fruit, cut one hand at a time as it ripens. The harvested the stalk should be hung in a cool, shady place. Mature fruit gives off ethylene in small amounts. This gas helps initiate and stimulate ripening. Covering the bunch with a plastic bag will hasten the ripening process.